Take down castles full of enemy soldiers serving the evil dragon that has kidnapped the princess in this 3D physics game. In the 3D physics puzzle game, Catapult King, players are on a quest to save a kidnapped princess from an evil dragon and his army of obnoxious knights. To do this, though, players have to blast their way through all kinds of protective buildings, laying waste to the dragon's army and defenses. As the game's title clearly suggests, the weapons of choice in Catapult King is, of course, a catapult. 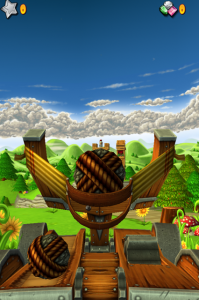 The players controls the pitch and direction of the catapult and pulls back on its slingshot-like launcher to control its power. Ultimately, this game isn't very far from what a three dimensional version of Angry Birds would look like. There are structures with enemies inside them to destroy and a slingshot launcher to use to launch projectiles in its direction. However, the similarities end there. Much like other physics destruction games, Catapult King has many different types of projectiles that players can unleash on their targets. These shots aren't just handed over to the player, though, they have to be earned. In each level, depending on their score, players are awarded magic points. They can then use these magic points to purchase magical augmentations for their normal cannonball shots. These magical upgrades include aiming assistance for precision shots, an earthquake inducing burst shot, and a devastating lunar strike shot that showers meteorites from the sky. Using these powerful shots is a lot of fun, and it's nice that they have to be saved for and purchased so they don't get overused. The visuals in Catapult King are well done and some parts of the game are downright gorgeous. The character modeling on the princess and knights is a little bizarre, but they are all well animated and the enemy knights even perform little taunting animation while you try and blast them out of their structures, which is a nice touch. Catapult King does a fine job at bringing the popular physics puzzler genre to 3D, and even if it doesn't really do much more to move the genre in a new direction it's a fun game to play.